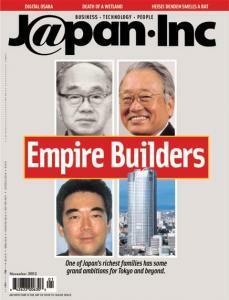 On the cover: (Clockwise from left top) Taikichiro Mori, Minoru Mori, Roppongi Hills and Hiroo Mori. Photograph of Hiroo Mori by Eiko Nishida. How much is an Innovative Engineer Worth? Despite the planned withdrawal of Nasdaq US from Japan, some companies --like Net Village -- went ahead with plans to go public on Nasdaq Japan. Ever notice how much money a call from a fixed line to a cell phone costs? There's a very good reason. The home of the future will include cooking by keitai. A New Zealand entrepreneur hits the right note with Japanese consumers by offering organic feminine products through her Web site. It's Our Birthday Again: We're thinner and poorer as we turn three, but dammit, we're still here!! Wow. What a year. We know what pediatricians mean when they talk about the "terrible twos." Our last year was one of transition -- from a magazine that grew up in the Internet bubble to a magazine that knows how to survive in an anemic economy. It was also a transition in terms of what we covered; while tech news is still our bread and butter, we branched out into politics and economics and even covered some social issues only tangentially related to tech. So here we are -- thinner, wiser and more, shall we say, fiscally responsible, and we're still covering the world's second biggest economy. Gotta love it. The Mori Building Co. is run by one of Japan's richest families, and patriarch Minoru Mori seems to have the ambition to match his bankroll - for starters, he's out to change Japan. Japan's second city is trying to revive parts of its downtown by turning it into a high-tech haven. Is the plan smart or does it reek of desperation? Alex Stewart is on the case. Photographer Michael Stanley brings us the first in an occasional series that looks at Japan's government spending through the lens of a camera. First stop: Isehaya Bay. Two veteran lawyers take us through the fast-changing world of Internet law in Japan. How Japan's electronics makers are faring. Sportsmen and women, the millionaire club and the benefits of math.